My non-stop summer movie watching continues. I've been to see Guardians of the Galaxy 2, Alien: Covenant, King Arthur, Spider-Man: Homecoming and now War for the Planet of the Apes. I will start by saying that if you saw Dawn of the Planet of the Apes, you have already seen War for the Planet of the Apes. Despite taking a page from the old spaghetti western films and borrowing (boring?) the kind of vast panoramics, character close-ups and lone vigilante on a quest themes somehow War never Rises to the level of the classic films it is modeled after. We never get much opportunity to care about any of the individual characters, so when they do die (and lots of apes die) there just isn't much emotional investment anywhere in the movie. The story is pretty typical... a rogue military commander attacks the ape city, slaughters a bunch of people and then Caesar sets out to get his revenge. Instead of getting his revenge, Caesar mostly kinda sits around in a cage for the entire movie waiting for a final battle that doesn't involve the Apes at all. I know that might be a minor spoiler, but it is kind of hard to spoil something that never happens. The movie never takes any chances. Despite borrowing the Alpha/Omega symbol from Beneath the Planet of the Apes and throwing in character names like Nova and Cornelius, there is no Alpha/Omega bomb, no hints about psychic sub-humans and certainly no dynamic planet-shattering ending to an otherwise excellent series. 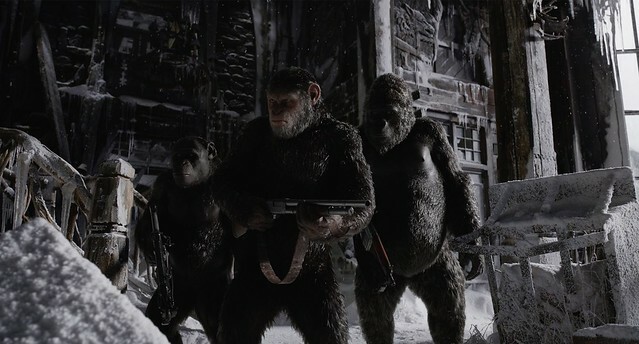 When you consider that Planet of the Apes picked up after some kind of a huge nuclear holocaust that caused mankind to revert to either sub-humans or underground psychic mutants, War for the Planet of the Apes ends with a snowstorm. Not kidding. It feels like director Matt Reeves (who is now slated to direct the next Batman film) gave us the first 2/3rds of a movie and then just stopped because he wanted to spin out one more sequel in two years. I enjoyed seeing all the characters return and the CGI and 3D were excellent, but this just wasn't the big budget end-of-summer finale I was hoping for. Perhaps Valerian will be better. Perhaps Valerian will be better. Based on all the reviews I have been reading, you are betting on the wrong horse. I saw a very opposite review, the title was "Drama covered under trhe guise of a summer block buster" and the reviewer loved every second of it. At one point he writes "there's not much dialogue in the movie, which will make it hard for some people to connect to it, BUT if one can surpass that, than you reveal a masterpiece." At the start he claims "If you like sci-fi and drama, you mustn't miss this movie, I repeat, u mustn't miss this movie. It's a masterpiece"
Just saw this yesterday. My wife asked me after the movie what I thought. I said: "Boring and really, really bad". Her response: "Oh thank god, I thought it was just me." My wife also usually finds my tendency to point out plot holes annoying at time, but this time she was right there with me listing them. No spoilers, but there are some whoppers in this movie. If you like a plot that hangs together, this isn't it. My advice is pass on this one. I think they were relying heavily on the previous movies to provide empathy for the characters. Having just re-watched the first two movies shortly before seeing "War...", this worked well for me, but I can see having your thoughts on it if you hadn't seen the first two in a while. I just watched the previous film the night before. So I agree that they are relying on your compassion for the characters who die from the previous films, which is a big mistake. I still think having someone from a previous film just die off at the beginning of a movie is a mistake. If Captain America died in the first 15 minutes of Avengers Infinity War I don't think it would have much impact. It has to be kept within the story itself or it just doesn't work. I still like the original films much better. What happened to the bomb? So much more character depth in the original. The actors were much better. How can you beat Charlton Heston? Exactly. Woody totally tells us that there are all these weapons still hidden in the mountains, then never bothered to show us any special weapons or even bother to show us the insdide of the mountain at all. It's a missed opportunity for sure.